I’m getting calls from several parts of our area and other parts of the country about this common summer phenomenon. It may be happening more than normal this year because of the cool/hot/cool/hot weather. It could also be related to drought. Here’s an update for you on a previous report we did. Limbs fail sometimes because of defects and unusually heavy loads of foliage, but there is another kind of failure known by one of these three terms "summer limb drop," "high temperature limb drop" and "sudden branch drop." It seems to occur when trees are struggling to balance the water coming in and leaving the plant through transpiration. 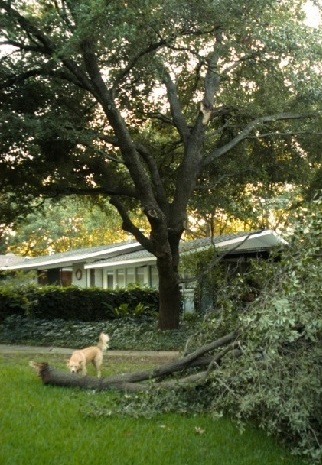 On windless, hot summer days or evenings, large limbs suddenly and mysteriously break with a loud "crack" and crash to the ground. Failed limbs usually reveal no obvious external defects and the inner wood is broken bluntly, with no sharp splintering. What can you do? Neither homeowners nor arborists can easily detect conditions that lead to structural failures, and no one can guarantee that a tree will not fail. Trees are living organisms and they may fail in ways we’ll never fully understand. Sudden limb drop is a perfect example. Trees reported to be susceptible to summer limb drop include but are apparently not limited to: oak, poplar, willow, elm, chestnut, chinkapin, beech, ash, eucalyptus, pine, cedar, sycamore, tree of heaven and others. 2. Quality pruning that avoids flush cuts and excessive thinning. Surprisingly, proper watering is the biggest challenge. Stress in trees caused by improper watering (primarily over watering) is very common. On the other hand, light frequent watering cycles over a long period of time weakens trees by promoting shallow, weak root systems. Remember it is better to water less often for long durations to help promote deep healthy root systems. The Sick Tree Treatment will help.